Children and families gathered in Marine Park Saturday, March 27, for an afternoon of rides, hot dogs, cotton candy and egg hunting. All of the removed Seba Avenue Park benches that were being removed off their bases have FINALLY been secured. A couple of weeks ago a contractor came in and secured the benches with new bolts and actual cement. The benches that were stolenfor keg parties were also FINALLY removed. Look what was found in the debris! A store for rent number. As it stands right now, we should have an answer, possibly with a meeting from at least one of these agency’s: DEC, Parks, Sanitation Enforcement next week. What’s worse than woodchips and the subsequent woodchip gate?! 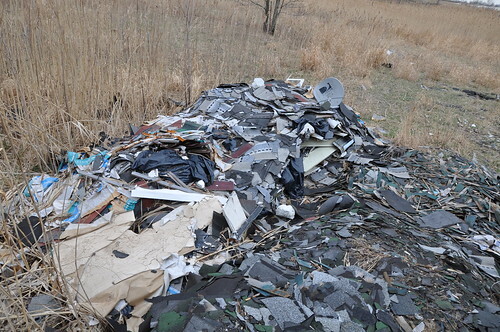 Blatant dumping in our own backyard. 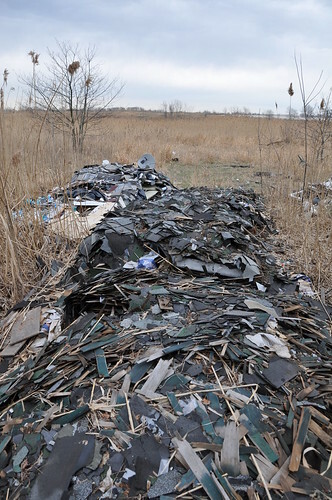 Back weeds, directly behind the 8-track, there are 4 piles/strips of construction debris. It is all construction debris that was dumped out of a dumpster. It looks to be mainly roofing material but it basically looks like an entire house was gutted, put into dumpsters, then dumped back weeds. It’s literally everything you would see in a gutted house including a kitchen sink, awning, and satellite dish. The area in question, which everyone should see, is behind the 8-track. After a little bit of walking around you can see the vehicle trail through the weeds. It appears that a vehicle entered the 8-track from the main trail from where they could of entered pretty much through any gate. Which begs the question: How did they get through the gates? Who has responsibility for these gates? The city? A local organization? Then, more importantly who committed the act? Seriously! This is truly horrible. 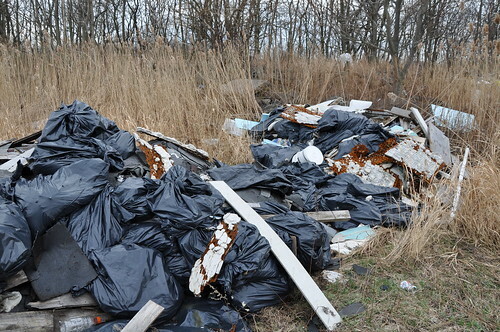 Not just because they dumped all of this garbage but because you have this strange feeling that it could be “locals”. What kind of person dumps this stuff? Good luck to them when the investigation starts. We will be updating this story as more updates come out. This tree at the last house at the point has been uneasily leaning against the house. It’s been temporarily secured with a chain but is still in danger of falling. If there are any other trees out there please call 311 to report a dangerous or fallen tree. State Senator Marty Golden is hosting an Easter Egg Hunt this Saturday at Marine Park. We have a lot of dogs in Gerritsen Beach, sometimes dozens per block. On a decent day you will see lots of dogs in their respective yards. Which brings me to an issue I am hearing about more and more each day: Excessive dog barking. Senator Golden is hosting his annual Women’s History Month Awards on Thursday March 25th at 7pm at the Cort Club. Two of the honorees are from Gerritsen Beach:Donna Davis and AnnMarie Corrado.